There’s a great post over on arstechnica asked for a home storage cloud that would seamlessly link together all his home storage. "So I’m ready for some cloud storage. But I don’t want all my gadgets to connect to some distant cloud. Rather, I want them to be the cloud, so that my data surrounds me like some mist with a life of its own, instead of sitting in these little isolated balls that I have to juggle." While I was reading though it two things came to mind, the first was Mesh and other cloud storage services. After all why have storage in your home if you can get it cheaper in the cloud. Of course for home media use cloud storage itself isn’t much help, you need the data locally. That’s where Mesh could play a part by taking care of syncing data across devices via the cloud. However in this scenario either all the data would be on all the devices or you’d need to setup and maintain lots of individual folders. Oh… and 5GB isn’t going to hold much music these days. 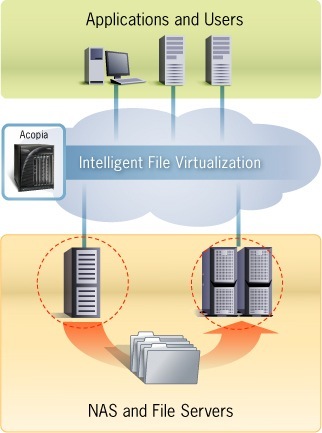 The second thing that came to mind was a File Virtualisation solution I saw last year from Acopia (now owned by f5). File virtualisation provides a lay of abstraction between clients that create and consume data and the storage devices that it is stored on. Essentially the virtualisation layer provides a single namespace that all clients connect to. As this layer is abstracted from where and how the data is physically stored the data can be located in the best place for that data. What’s more it can be dynamically moved around physical storage devices without these changes ever being visible to the clients. This lets you do very clever things. You can automatically determine what the most accessed files are an move them to your fastest storage. The least accessed ones you can move to cheap, slow storage. Don’t want MP3’s clogging up you file servers? (well it is an enterprise solution…) That’s fine, just define a rule that says all MP3’s should be hosted on a single cheap NAS somewhere. Need to move all the data off a SAN that’s seen better days? No worries, setup a rule or task and it’ll be moved without the clients ever seeing a thing. Ok… so for now this sort of thing is the realm of Enterprises. And Enterprises with deep pockets. But, it is – I think – what Jon is looking for in his article – his digital mist (I like that term!). Probably more so than Mesh, at least for now. However… if Mesh is providing a ring of devices on which you’d like to store your data. It’s not too hard to see someone writing an equivalent of the Acopia ‘rulebase’ to manage a set of devices linked using the Mesh framework. Could be quite useful in a few years. Most of this can be done with DFS within the enterprise (if you have MS servers). However, I would love to have somewhere I could store all my music that would sync all the devices I use, ie various pc’s and mobiles etc. DFS is definitely useful, we use it here, but File Virualisation does add a massive amount to what can be done. Being able to complete abstract everything below the namespace makes managing data a storage so much easier.